On the morning rush hours of Monday, April 30, a suicide bomber on a motorcycle blew up explosives near an Afghan intelligence unit that left several civilians killed and injured. To maximize the death toll, a second suicide bomber on foot was guided to the scene to detonate himself near a crowd of journalists and passersby who rushed to save injured and live stream report from the horrific spectacle. It took the lives of 36 civilians including 10 journalists. Known as a black day for journalism in Afghanistan, Monday blasts marked a record high blow to the lives of journalists and photographers in a single day since the US-led invasion in 2001. ISIS-K (The Islamic State of Iraq and the Levant – Khorasan Province) , claimed responsibility for the attack. The callous targeting of ordinary people against whom they have waged an undeclared war now, suggests that they all [Taliban, ISIS-K, NATO] equally scapegoat the innocent people in their fabricated war against each other. More than a week ago in Kabul, a suicide bomber ripped through a pack of people waiting in line outside a voter-registration center and killed at least 57 people and injured 119 others. On the same deadly Monday, another suicide bomber struck a convoy of international forces in southern Kandahar province that killed 11 Afghan children and injured 16 international and Afghan forces. Such coordinated attacks in a single day raise doubt over how so-called rebels manage all these complicated plots singlehandedly. Some people blame Afghan security authorities, while others lash out at Pakistan, but something is missing in people’s perspective and criticism. The complex path of terrorism has perplexed an entire nation which struggles to know who is behind these well equipped suicide bombers? What is the purpose of ISIS-K or the Taliban to kill civilians? Do they reap any profit from these bombings? Some military experts opine that the terrorist groups resort to killing civilians when they fail to reach out to military targets. Others claim civilians are accidental casualties of ISIS-K or Taliban’s war on the Afghan Government. or international forces. Again, they are wrong. There has to be a reason why the militant groups are killing ordinary people. This war can no longer be identified as a terrorist operation against the Afghan government or the US, because they have evidently targeted innocent civilians. Remember, every time a blast in Kabul kill dozens and the news sensationally reverberates across the West by means of mainstream media, it further entrenches the footing of US-NATO in Afghanistan. A chief cause of regular bloody incidents especially in the capital is to show the world a sign of persistent insurgency in Afghanistan that requires the “persistent presence” of US-NATO, with a view to “waging a war on terrorism”. For Afghans, a month or two of tranquility and eventless Kabul could mean a deadly plot of attacks ahead. Victims could be doctors in a hospital, children near a school, journalists near a scene or employees near a government institution. Despite the fact that these dirty plots are routine resulting in the deaths of innocent people, the US-led Afghan Government and NATO or specifically the US are sitting back, they are spectators, they have been watching this happen for more than a decade. Unlike a common perception that routinely blames Pakistan as a sole facilitator of terrorism in Afghanistan, the suicide bombers are now prepared and armed near “you” in Kabul. For war policy makers based in Kabul or elsewhere, it has become quite easy to hatch and implement a new terror plot. 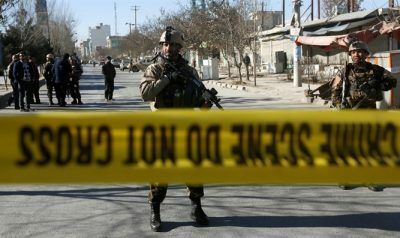 Afghan authorities and Members of Parliament have repeatedly been blamed for many attacks in Kabul. But none have been tried or prosecuted, let alone their foreign masterminds. Former ministers of security affairs or current Intelligence Chief Masoom Stanikzai or Afghan Security Advisor Hanif Atmar have come under fire of accusations from different internal and external sources and media for supporting terrorism in Afghanistan, but neither Afghanistan’s Supreme Court nor the Attorney General’s Office are authorized to seriously investigate the cases, nor the US and its allies lead any international court that would publicly though honestly convict a war criminal. While the mainstream media coverage of these terror events affects the sentiment and emotions of Westerners. it fails to address the broader issues. Public opinion is thereby distracted from a broader understanding of the mayhem and havoc in our country, which is illegally occupied by foreign powers. Featured image is from Israel National News.